The deadly conflict in Yemen, which has been raging for the last three years with no signs of letting up, is being called the "Forgotten War" because most of the world's attention has been focused on Syria. 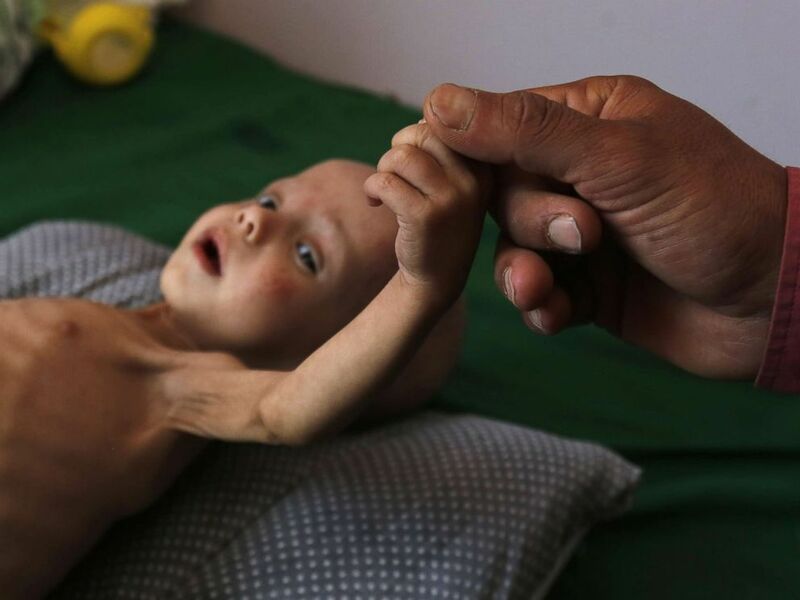 A bombing campaign by Saudi Arabia and its allies against Shia rebels has left around 2.2 million Yemeni children malnourished -- 80 percent of them severely -- and the country is on the verge of a man-made famine. Lutf Ali al-Shahari sits on a pavement in Sanaa, Yemen, March 24, 2018. "Life in a time of war is tragedy, injustice, and destruction of houses and roads. Also, food is barely entering the country. Prices are high," he said. The International Rescue Committee (IRC), a U.S. aid organization, says one child younger than 5 dies in Yemen every 10 minutes from preventable causes. Much of Yemen's infrastructure has been decimated, including schools, bridges, marketplaces, hospitals and health facilities, making 79 percent of the population dependent on humanitarian aid, according to figures compiled by the IRC. PHOTO:A malnourished Yemeni child receives treatment amid worsening malnutrition in the emergency ward of a hospital in Sana'a, Yemen,Nov. 15, 2017. More than 50,000 children under the age of 15 are at risk of death from severe acute malnutrition. The country's ability to provide safe drinking water has been completely destroyed by the bombing campaign, leading to the world's worst outbreak of cholera, with more than a million reported cases of the disease, according to the International Committee of the Red Cross. The U.S. is increasingly being seen as one of the chief instigators of Yemen's suffering, supplying massive amounts of weaponry, technical assistance and military support to the Saudi coalition, thus enabling the misery to continue. The site of air strikes is pictured in Sanaa, Yemen, March 21, 2018. 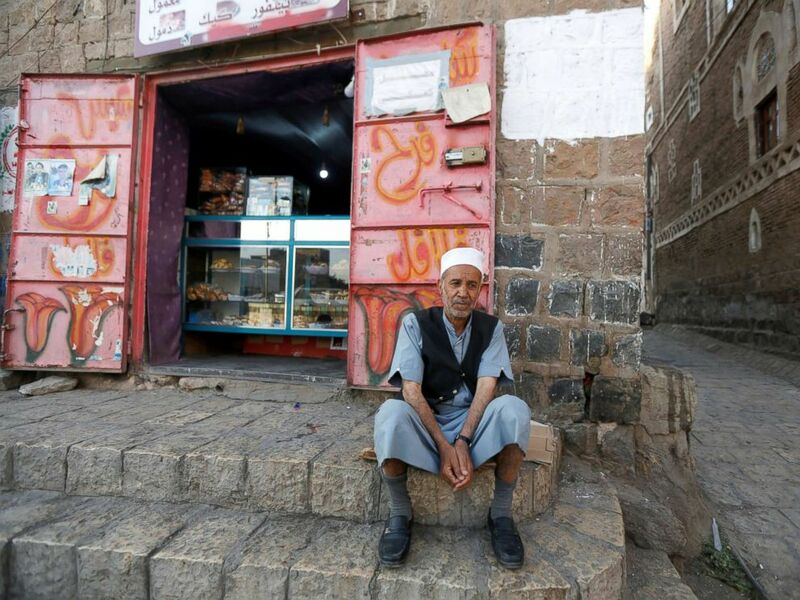 Yemen's instability has also been bad news for the war on terror, because extremist groups like al Qaeda and ISIS are flourishing amid the chaos and the lack of law and order. Straddling the crossroads of Africa, Asia and the Middle East, at the southern tip of the Saudi Arabian Peninsula, the region was one of the most important trading hubs of the ancient world. However, the modern nation of Yemen is the poorest country in the Middle East and has been plagued by unrest since it was unified in 1990. 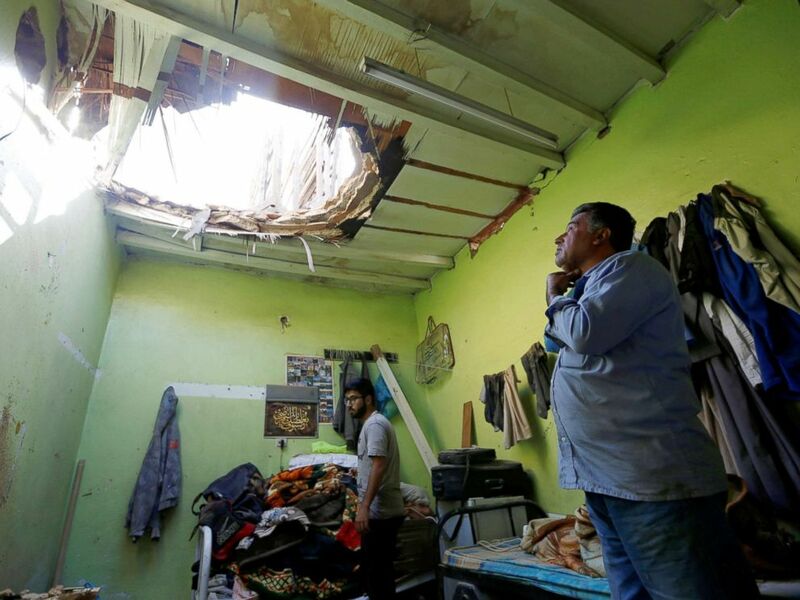 People check the damage after debris from ballistic missiles fired by Yemen's Houthi militia fell onto a house in Riyadh, Saudi Arabia, March 26, 2018. All of that unrest came to a head during the Arab Spring in 2011 when Yemenis, after suffering under years of poverty, high unemployment and a corrupt and dysfunctional government, rose up against President Ali Abdullah Saleh and forced him to step aside. Abdrabbuh Mansour Hadi, Saleh's vice president, came to power in 2012 but he never managed to regain control. Much of the army remained loyal to Saleh and followed him when he united with tribal rebels from the north of Yemen, called Houthis, whose members belong to a branch of Shia Islam known as Zaidism. In September 2014, the conflict escalated drastically when the Houthis overran the capital of Sana’a, forcing Hadi to flee to Saudi Arabia. 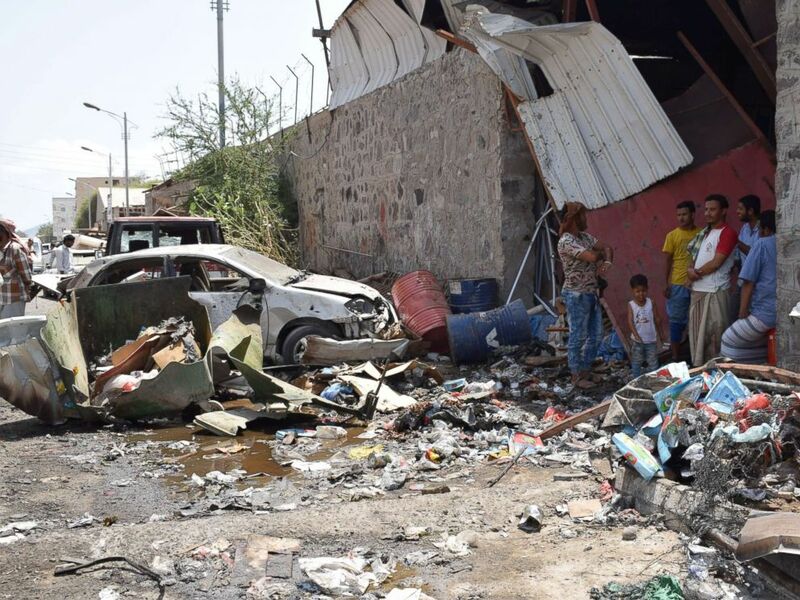 As with many of the conflicts in the Middle East right now, Saudi Arabia and Iran -- the region's heavyweight rivals -- quickly became involved in the conflict, with Saudi Arabia backing the government of Hadi and accusing Shia Iran of supplying weapons to the Houthis. In March 2015, an international coalition of Arab states led by Saudi Arabia hit back at the Houthis by launching the air campaign that has now devastated much of the country. At the same time, a ground war being fought by competing factions reached a stalemate. Making matters worse, punitive blockades on Houthi-controlled air and sea ports by Saudi Arabia stopped the majority of food imports. Trapped in the middle have been civilians who want no part in the war. As of February, the United Nations had documented 15,467 civilian casualties in the war, but the real numbers are believed to be much higher. 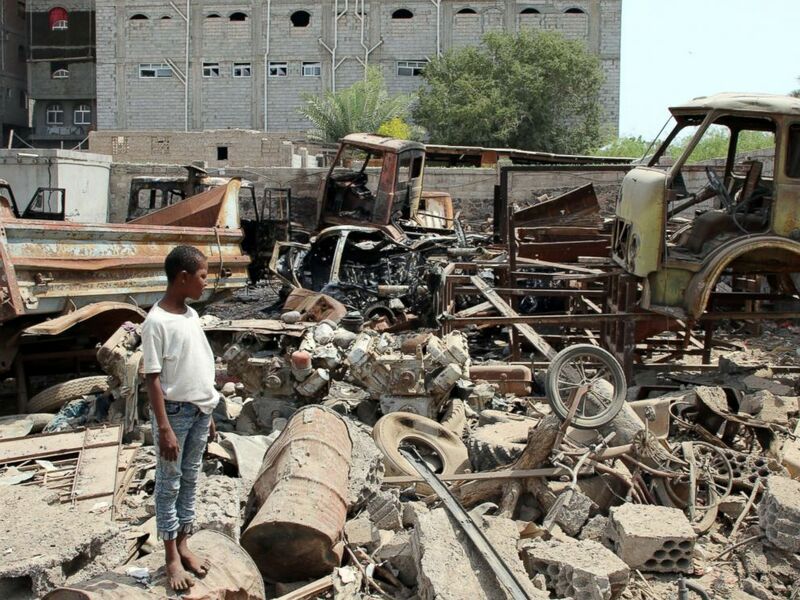 Now, amid a high profile visit to Washington, Saudi Arabia's Crown Prince Mohammad bin Salman is bolstering his armories with even more weapons from the U.S.
A boy is seen on the site after a car bomb ripped through a military kitchen in Aden, Yemen, March 13, 2018. President Trump welcomed the prince in the Oval Office recently, announcing the kingdom had completed sales of $12.5 billion in purchases of U.S. jets, missiles and warships since Trump visited Saudi Arabia a year ago. At the same time, Saudi Arabia has embarked on a massive public relations campaign to deflect criticism of its role in the Yemen conflict. At the start of 2018, the kingdom pledged a $1.5 billion aid package to help the areas of Yemen under control of the Saudi coalition. But in the last nine months, Saudi Arabia spent many times that amount -- $54 billion -– buying weapons from the United States, leading critics like Jan Egeland, secretary-general of the Norwegian Refugee Council, to tweet: "That's 2.8% for aid and 97.2% to keep fuelling the reason people need it." #SaudiArabia pledged a generous $1.5 billion for aid in Yemen in January. But over last 9 months, it spent $54 billion on weapons from US alone. That’s 2.8% for aid and 97.2% to keep fuelling the reason people need it. Without a peaceful settlement, the suffering and bloodshed in Yemen will continue, with its effects being felt much wider. 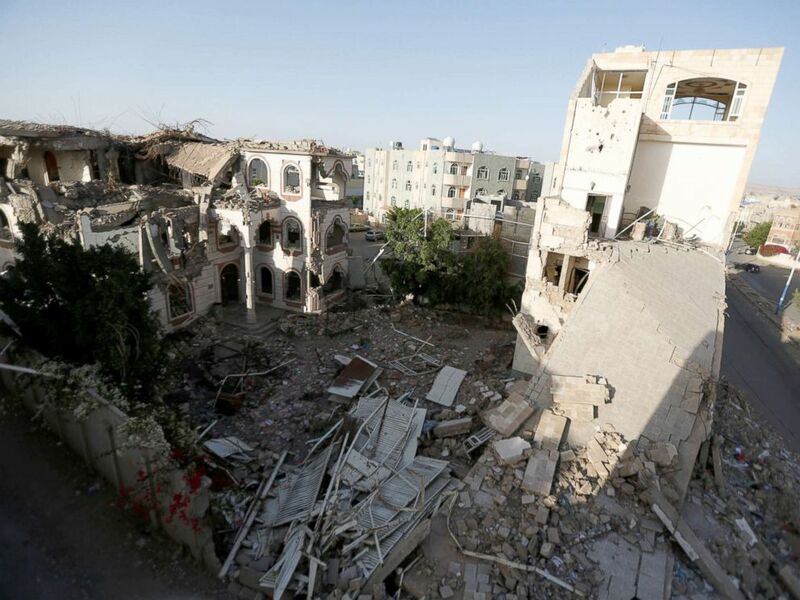 Photo taken on March 13, 2018 shows the site of the suicide attack in Aden, Yemen. The Saudi-led bombing campaign has decimated the country and provided steady streams of recruits to extremist groups like ISIS and al Qaeda in the Arabian Peninsula, one of the world's deadliest terror groups. These groups will continue growing amid the conflict, becoming further ingrained and fortified, continuing to plan and launch attacks against targets in the West.